Local artists Neale Bothwell, Graham Murdoch and Suzanne Kelly will show their latest works in Aberdeen’s Under The Hammer from 19 September. 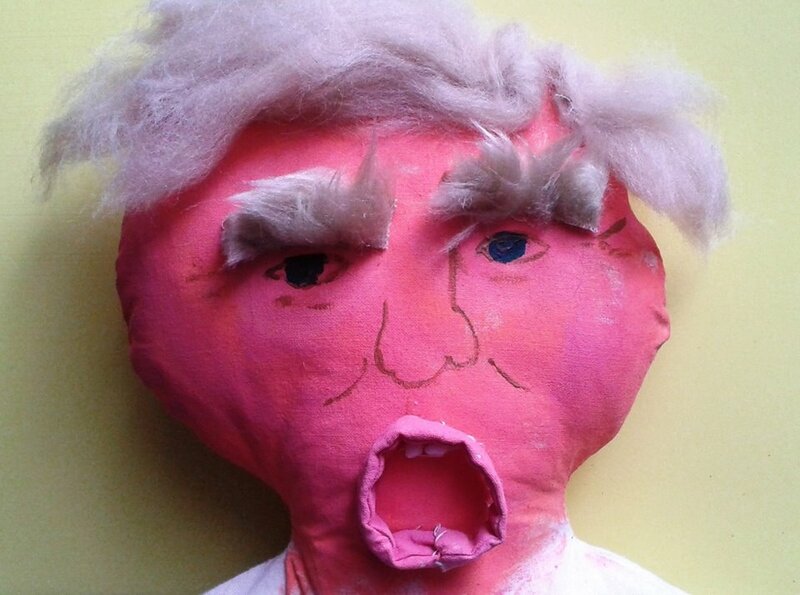 Kelly will display satirical dolls parodying Donald Trump and some of his entourage. The four dolls include Donald Trump in golfing mode – which will give a selection of Trump’s catalogue of offensive comments when its hand is shaken. Another Trump doll in Graduation mode commemorates Trump’s controversial honorary degree from Robert Gordon University. This degree prompted academic Dr David Kennedy to hand his own degree back to RGU in protest. There is also a Donald Jr doll in safari mode which talks when its gun is squeezed, explaining how his killing animals helps Africans. The fourth doll is the Menie Estate spokesperson, Sarah Malone, or Mrs Malone-Bates if you prefer. She married Aberdeen Journal’s supremo Damian Bates. Many speculate that this may have some connection to the positive media coverage Trump receives in Aberdeen papers the Press & Journal and Evening Express, which ignore the majority of anti-trump sentiment. The handmade dolls come in packaging labelled ‘Donny and Friends’. The boxes are adorned with pictures of pound signs, bags of swag, guns, golf motifs, etc. – as well as newspaper headlines from some of Trump’s debacles. Suzanne Kelly has kept a close eye on all things Trump related since his earliest association with Menie as a golf course location, and has been involved in many aspects of opposition the controversial development. Of the plight of the residents of Menie, Kelly is particularly passionate. “I’ve written a report on the Scottish Government’s handling of the Menie Estate. The legal environmental protection was stripped away on the promise of millions of pounds and thousands of jobs flooding into Aberdeenshire. The reality is considerably different. A giant bund of earth blocks the former view to the sea of Leyton Farm Cottage’s inhabitants – it serves no purpose but to intimidate as far as I can tell. “Local farmer Michael Forbes and his family had their water supply damaged, were threatened by police over what were civil issues, and had his access to the sea to fish cut off, with the police warning him not to attempt to take his boats and nets to the sea. “I’ve also helped the BBC’s Panorama team with their segment on Trump, which proved his links to organised crime. The Scottish Government doesn’t care. Neither do Aberdeen Sports Village, and when I last checked, some Aberdeenshire school children were sporting Trump-sponsored shirts. “I also had a photo credit or two in Anthony Baxter’s documentary A Dangerous Game; my photos showed huge piles of mixed rubbish on the Menie Estate. “Aberdeen Voice has also featured a fair quantity of my satirical writings on Trump. Writing about him satirically is a bit like shooting fish in a barrel. “This man is condemned by his own words, which show him to be a nationalist, racist, sexist piece of work. 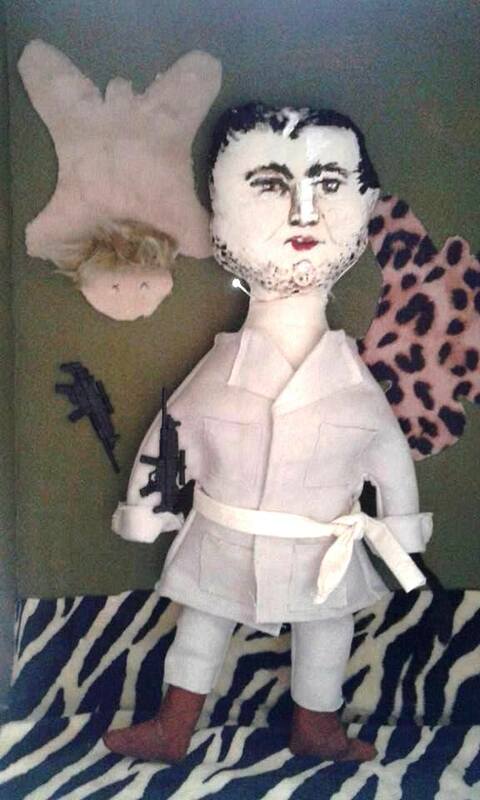 If the serious work I’ve tried to do won’t do the trick, I’ll try and make a few points using some satirical dolls. The work will be displayed for approximately 3 or 4 weeks.